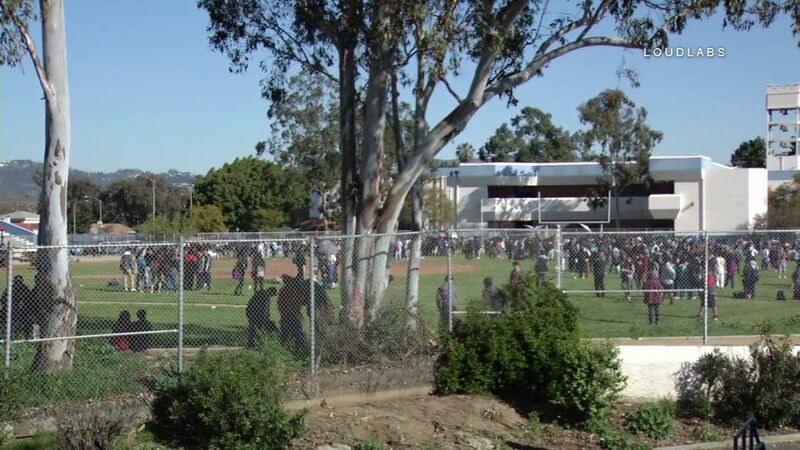 Students at Los Angeles High School were evacuated to the football field following a bomb threat on Wednesday, March 1, 2017. LOS ANGELES (KABC) -- A bomb threat prompted the evacuation of Los Angeles High School on Wednesday morning. Police responded to the campus in the 4600 block of West Olympic Boulevard just after 8 a.m. Officers are canvassing the campus, looking for anything suspicious. Some 300 students have been waiting in the football field. Police have not specified the nature of the bomb threat. A search of the campus was conducted, and the area was declared safe around noon, according to Los Angeles Unified School District police. No explosives were found, the Los Angeles Police Department reported.